You are here: Home / Team Building Activities / Launch It! Location(s): Outdoor Areas preferred but can be modified for tabletop challenges or conference rooms. Your team must launch, lift, and propel objects further, higher and more accurately than the other teams! This is the perfect event for technical teams or teams that like to go BIG. You’ll be responsible for creating projectile contraptions like sling shots, rockets, and catapults. Each round you’ll receive supplies and instructions for a new height, distance or accuracy challenge. Build the best device and you’ll earn BIG points for your team. The wow factor appeals to non-technical team members. This event requires teams to think outside of the box. The playing field constantly changes and the team is forced to evaluate existing strategies. Professional Emcee, Onsite Coordinator, Event Staff, Team Bandanas, Medals for the Winning Team, PA System (if allowed), Set-up/Teardown, Photos of the Day, Group Photo, Build Tools, Targets, Launch Materials, and Miscellaneous Construction Materials. Where can we hold the event? Any large open area at least 100ft wide and 300ft long. The more skilled your team is the farther they launch! We use water powered rockets! There is a chance you may get wet. We realize when the rockets launch it resembles ballistic warheads, but we do not allow ANYONE to try and catch the rockets. How many rockets are we building? 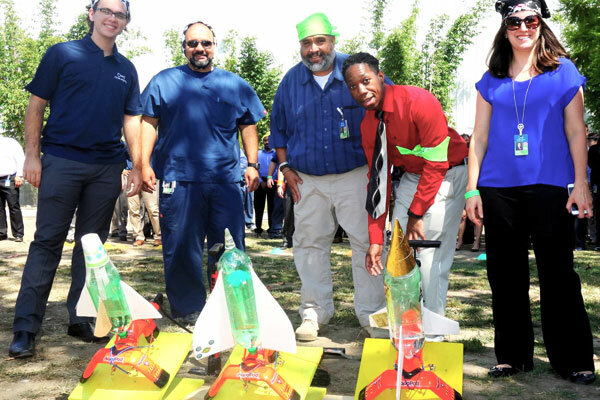 Each team will construct three rockets to compete for both distance and accuracy.